Where can you call home? Is it the town your family lives in? The city you grew up in? Or maybe it’s where you choose to raise your own children. Do you choose your home or does it choose you? Line 77 of the “Boulder Zodiac,” a poem written by Anne Waldman for the Boulder Tattoo Project, reads “you settled here.” This phrase rings true for many participants of the Boulder Tattoo Project, including the project’s manager, Chelsea Pohl. These participants all had a word or a phrase from Waldman’s poem inked onto their bodies as an ode to Boulder. “The rest of the world is just not as perfect. It’s contradictory: it’s easy to live here, yet it’s challenging. It’s challenging to become an adult here, but it’s a desire,” Pohl said. Pohl originally hails from Lexington, Ky. She started the Boulder Tattoo Project as an offspring of the original Lexington version. Her husband, Vincent Bachert, welcomed the task of inking over 200 project participants in the couple’s studio, Claw and Talon, with the help of several other Boulder tattoo artists. Two-hundred Boulderites were brought together through the collaborative efforts of Pohl, Waldman, and many others along the way. These tattoo artists were essential in manifesting the art, poetry, and above all, the feeling of Boulder’s interconnected community, onto project participants’ skin. 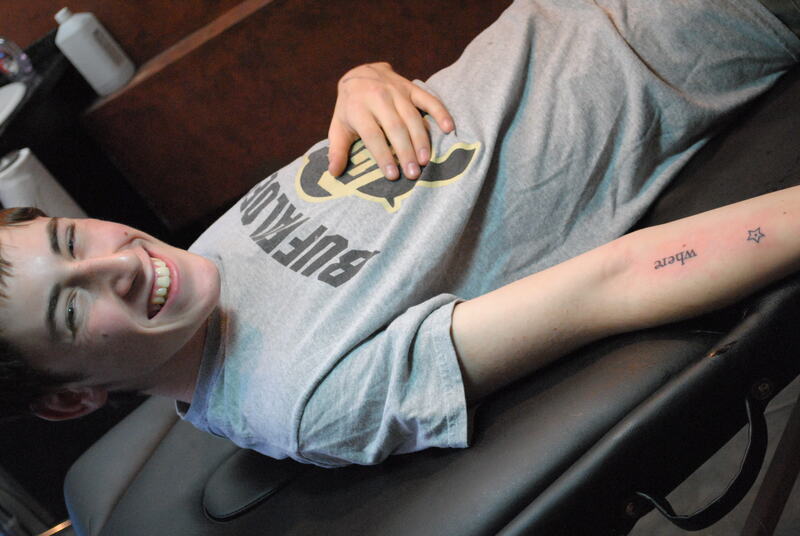 In May 2013, Pohl summed up her 13 years of experience in Boulder along with her feelings about the town in her “Love Letter to Boulder.” She also set forward her intentions for the Tattoo Project. “I think if I’m going to ask people to commit so permanently to their love for this city, I better be clear that I love this city just as deeply as I’m expecting them to,” she wrote. “People seeing the beauty of this valley will want to stay, and their staying will be the undoing of the beauty,” Arapahoe Chief Niwot supposedly said in 1858 – or so the legend goes. And how do you get rid of such a curse? While some may call Niwot’s words a curse, others only read them as a blessing. Tom Klenow is no stranger to ink needles; his arms are home to full, colorful tattoo sleeves. Originally from Fargo, North Dakota, Tom said recently moving to Boulder gives his tattoo and the project more significance, “in the sense that I feel more at home here than I ever did in North Dakota.” Up the Boulder was his chosen phrase. Lisa Roberts got her tattoo on the side of her right foot. It was her first. “I’m getting who. You can make it mean anything,” Roberts said. Although not originally from Boulder, Roberts has lived in in the town for over 25 years and said it’s “home.” Boulder was her number one reason for joining the project. Sean Held and Sierra Held are father and daughter. They were tattooed together on the project’s second day. Sean got the phrase keep scales aligning on his shin while Sierra chose go asymmetrical along her thigh. “‘Asymmetrical means nothing’s the same: be unique, be yourself; be awesome. It’s hide-able, but also show-able,” Sierra said. Her father had a different reason for his chosen phrase. “I always work hard at being the best person I can be. 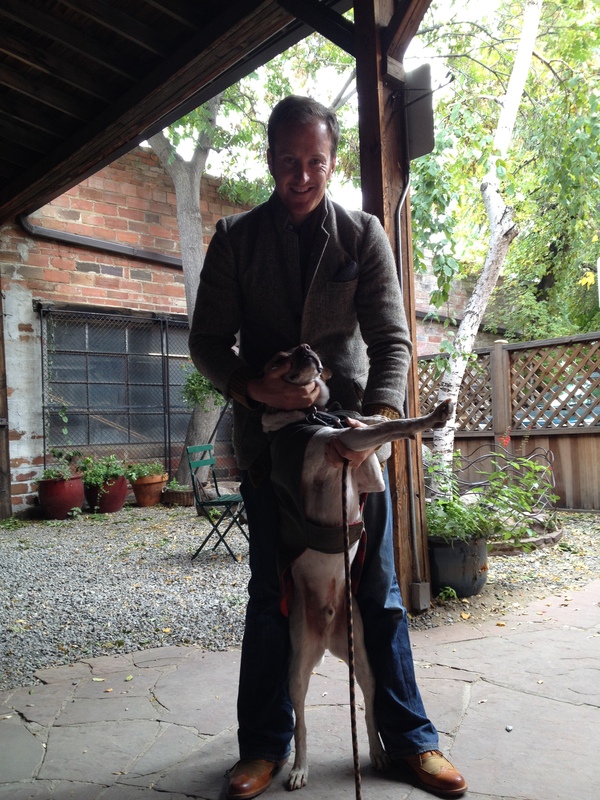 I’m balancing back and forth between the things I need to do and the decisions I need to make,” Sean said. Jessika Fleck’s forearm is now labeled, “your mind stays.” She wrote about the meaning of her tattoo on her blog, harking back to an accident she had two years ago in which she hit her head. At times, Fleck said, she thought she was losing her mind. “No matter how many loops the roller coaster has or if you happen to hit your head on a window, your mind can’t be lost or stolen,” Fleck wrote. Stories like this are what make the whole project worth it to Pohl. During the first weekend of tattooing for the project, word of mouth spread as participants began posting photos, blog entries, poems, and Facebook posts as odes to their tattoos and the Boulder Tattoo Project. “I cried out of joy, because that’s what makes it worth it – when people share their stories. I’m hoping we’ll get more of that,” Pohl said. To participate, project volunteers had to meet certain criteria, including but not limited to: “Consider Boulder home” and “love Boulder,” the latter being the number one motivator for participants. “We were told Boulder is a very transient town,” said Kremena Todorova, one of the founding artists of the original Lexington Tattoo Project. Todorova said that although she and Kurt Gohde, her partner in the Lexington Tattoo Project, were primed to feel this way before visiting Boulder, they also spoke to many project participants who are Boulder transplants. “It gets harder to stay here as you get older, because you have more responsibilities,” said Pohl. 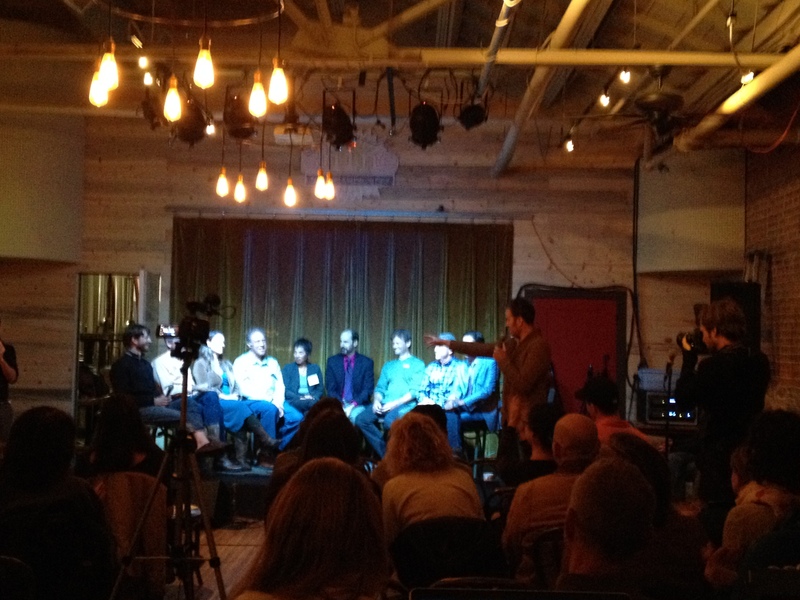 With local elections swiftly approaching, many young Boulderites may be thinking: so what? Waylon Lewis is the founder of the Elephant Journal and hosts the Walk the Talk Show. The Boulder City Council candidates participated in an open forum hosted by the Elephant Journal at Shine Restaurant and Gathering Place Wednesday, Oct. 16th. Chelsea Pohl is a kaleidoscope. As the project manager of the Boulder Tattoo Project, Chelsea has her eyes set on many artistic ventures and she isn’t set to stop anytime soon. 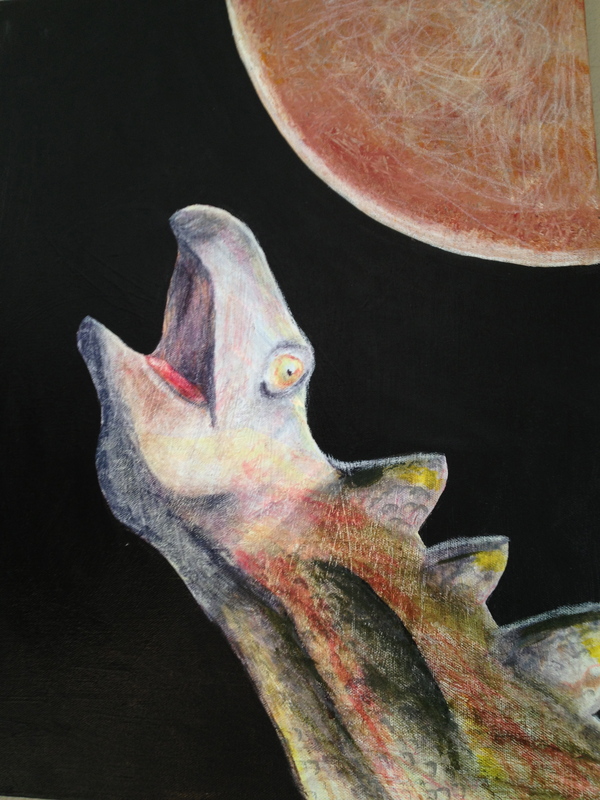 Chelsea Pohl’s series of dinosaur paintings is on display at Logan’s Espresso Cafe in Boulder. Chelsea paints dinosaurs. She paints blood splatters, cats, and critters. She is also a photographer and sculptor. She teaches art classes; writes and illustrates children’s books; owns a tattoo studio with her husband, Vinny, and raises two daughters named Tiger and Phoenix (which the tattoo studio, Claw and Talon, is named after). Chelsea manages all of this while successfully bringing the Boulder Tattoo Project to its new home. The project is a community-wide creative initiative which begins inking after Halloween, and Chelsea has been preparing for months. Chelsea is a hardworking businesswoman, entrepreneur, artist, and mother. She’s inspired, she says, and this inspiration is a gift she hopes she can pass on to others. Chelsea moved to Boulder when she was 17 years old. She knew she loved it long before that, however; the initial view of the Flatirons while driving over the hills of Route 36 for the first time struck a nerve with her when she was 13. It was an “aha!” moment she would never forget. Chelsea was accepted into Naropa University at age 16. Life would take its turns, leading to more travel and a life in Boulder. The people she would meet along the way would be the catalyst to a life of art, innovation, and inspiration. Chelsea Pohl co-owns Claw and Talon Tattoo on Folsom Street in Boulder with her husband, Vinny. Merm was one of the kittens that lived on the boat with the family. “Merm talk,” an invented language, progressed out of Chelsea’s childhood obsession with the cat. Now she has written and illustrated several books based on him, including “The Adventures of Merm the Cat,” which was released in August 2010. After some slight hiccups with a book deal, Chelsea decided to self-publish. She said she doesn’t know how people received the Merm books, but that’s not the point. The Boulder Tattoo Project came out of Lexington, Ky. A collaborative started by two artists, Kurt Gohde and Kremena Todorova, the Lexington Tattoo Project is an ongoing project containing the elements of a poem, tattoos, photography, and now a book. “Chelsea is the first person to invite us and this Tattoo Project artwork to another city besides our own,” Kurt Gohde and Kremena Todorova wrote in an email. Chelsea learned about the project through her sister, Alyssum, and decided she wanted to bring the project to her adopted hometown. She went back to Lexington where Gohde and Todorova invited her to take part in the Lexington initiation. “That just made sense! I’m the bridge between the two cities,” said Chelsea. Vinny did her tattoos in Lexington. “Deep Roots” now rest respectively on each of her ankles. Chelsea remarks that it was a good experience to reconnect with her old town, a place she doesn’t often go back to. The Boulder Tattoo Project’s next event will be at the Laughing Goat Cafe on Pearl Street on Halloween night. Participants and the public are invited to attend. A silent auction with donations from local artists and vendors will benefit Boulder flood relief. The tattoo projects are all about community. They are about showing love of one’s city. It’s not just about tattoos. The project is about peoples’ connections to their city and how they express that. How else can one usually do so besides living in a town? 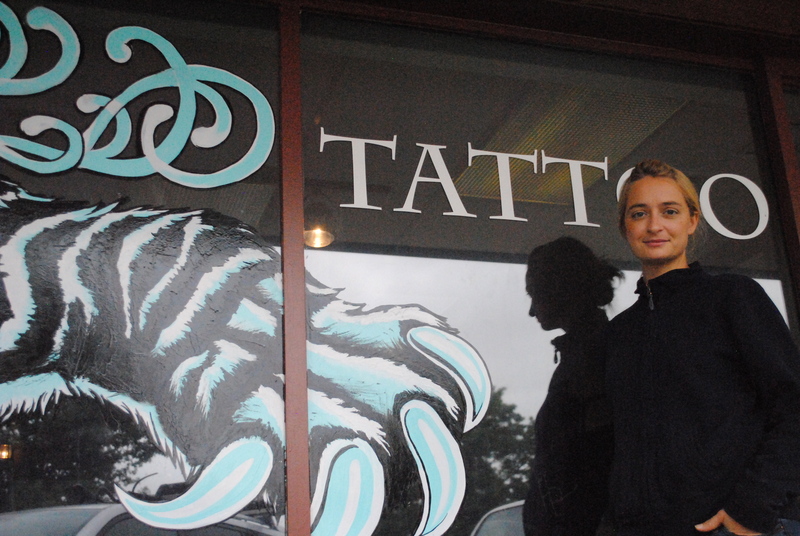 Chelsea will be conducting a demographic survey at the tattooing to see what participants’ backgrounds involve. All kinds of people get involved with the project. “There are a lot of first time tattoo-ees,” Chelsea said. 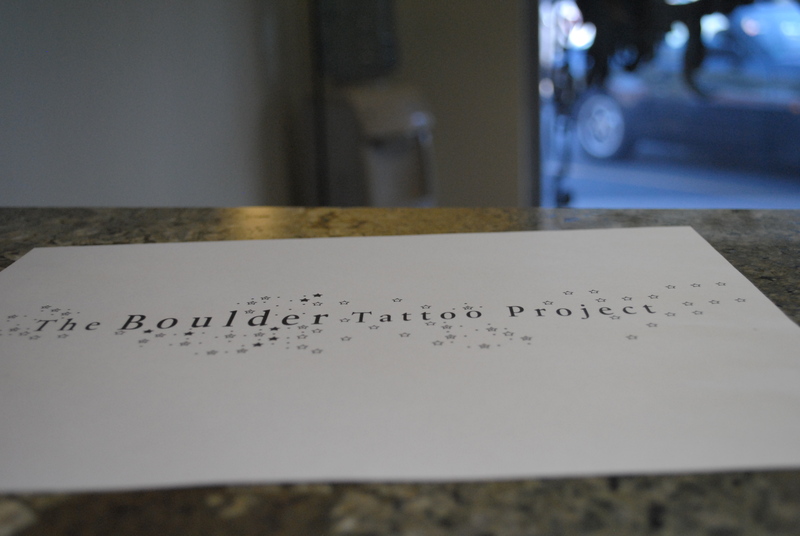 The Boulder Tattoo Project will not only consist of tattoos. The multimedia collaborative will feature the poem “Boulder Zodiac” by Anne Waldman; words and phrases of the poem as tattoos; photography of the tattoos and their owners; a music score by Gregory Alan Isakov; and a final film which will combine all of these individual elements. “Chelsea has set an extremely high bar for the people that we will work with in other cities–she has been twice the collaborator we hoped for and Boulder is so lucky to have her,” Gohde said. Want to get involved in the project? It’s not too late! 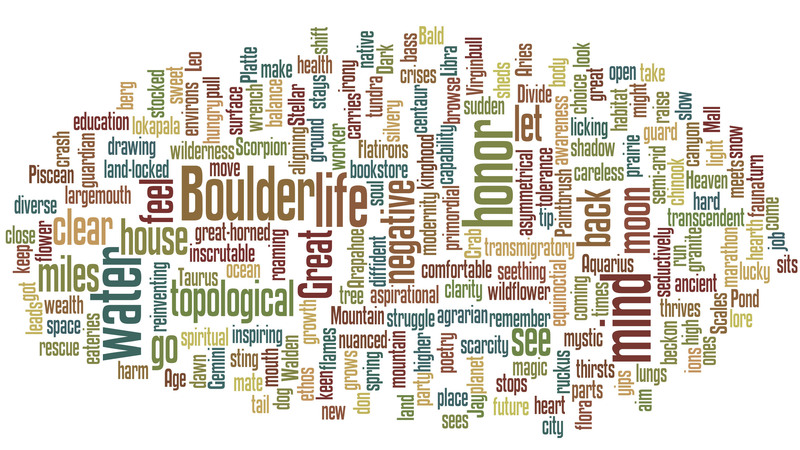 Even though the project has given away its 200 words and phrases from Anne Waldman’s “Boulder Zodiac” poem, those still wanting to get involved in the Boulder Tattoo Project can receive commas for the shop’s $50 minimum. They won’t be covered by the art grants which are supporting the project, but they will allow Boulderites to feel like a part of the community and the Boulder Tattoo Project – exactly what Chelsea hopes to achieve.